Tofu salad with Herbed Persimmons Dressing is a cold salad and can be served as a side dish in this summer. Persimmon, rare fruit, is sweet and has delicate taste. This fruit contains high levels of dietary fiber and has lots of vitamin C. By adding parsley herb into the salad nutritional value increases. This sweet, salty and spicy salad is easy to make and beautiful to serve. Press the tofu between tissues for few minutes and cut into small square pieces. Bring some water to boil in a heavy saucepan and add tofu to it and cook until tofu becomes soft. Drain and keep it aside and let it cool completely. In the meantime puree the persimmon. In a separate bowl combine pureed persimmon, parsley, and all the spices. Let it stand for 2 minutes. 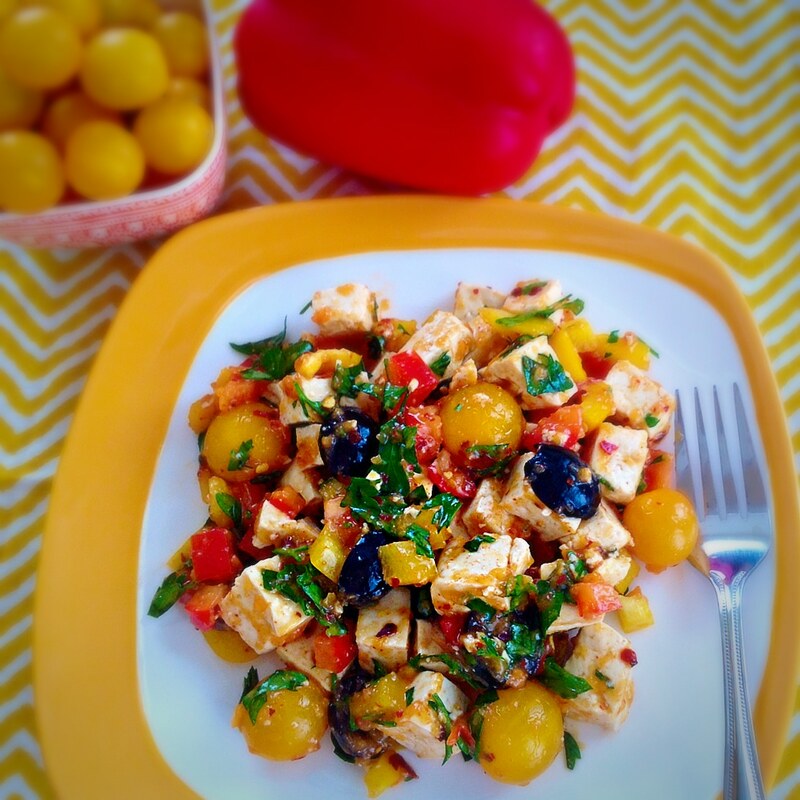 In a separate bowl combine the yellow bell pepper, red pepper, tomatoes, olives, tofu and the dressing and mix well until all the tofu pieces are properly coated with the persimmon dressing. Lastly, mix in the flax oil for the salad to retain its moisture and increase its nutritional value. Refrigerate the salad for at least 10 minutes before serving. Note: If lesser strong taste of parsley is preferred then change the measurement of parsley to ¼ cup instead of ½ cup. Can be prepared much ahead of time and kept in the refrigerator. After boiling the tofu when cooled make sure to drain the tofu properly so that no extra moisture in retained in the salad. Otherwise it will become soggy.